Greetings from Luang Prabang, Laos! Sorry for the lack of posts recently. 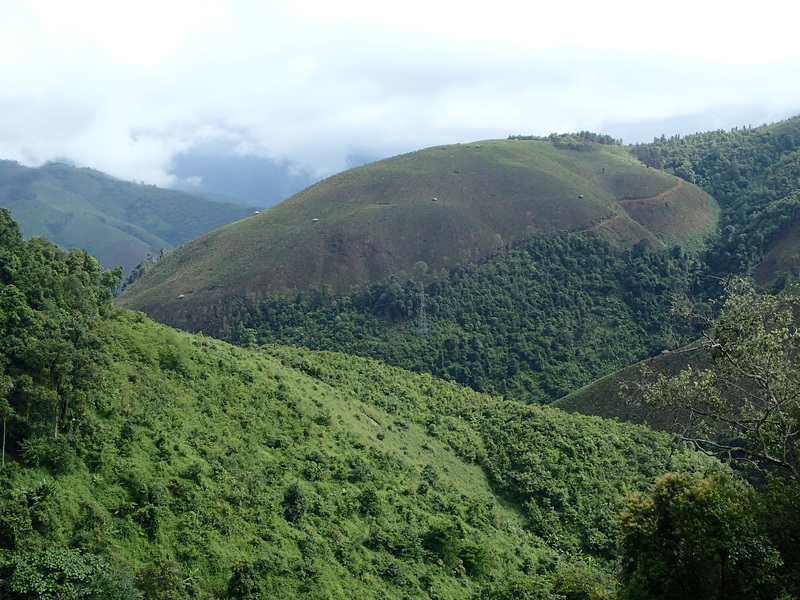 Internet has gotten to be a much more precious commodity the farther that I’ve gotten into Laos. I’ve got several posts that are handwritten in my journal that I need to get busy transcribing onto the computer, so expect a more vibrant blog the next few days. I got into Luang Prabang 5 days ago, after a very tense bus ride that included the transmission literally falling apart in the mountains between Vang Vieng and here. It was a 6 hour bus ride that ended up being 12. Luckily we got picked up by another bus that was coming through the mountains, which then led to an even more tense 4 hour bus ride on a double decker that was double loaded. The fact that there were no guardrails on the road only added to the adventure, but I was quite happy that I had a Valium in my bag to try to calm down while I saw my life flash before my eyes. Transportation here is always an adventure, but the views were absolutely unbelievable. Once we got to Luang Prabang, we headed down to the vibrant night market to get something to eat. There were stalls down an alley, which had a buffet of fried rice, 10 different kinds of noodles, fried banana, tofu and every vegetable you can imagine. $1.25 a plate and if you wanted to get really luxurious, you could add a grilled skewer of chicken breast for another $1.25. I washed it all down with a delicious 16oz $1.25 Beer Laos, and ended up having an absolute feast for all of $3.75. Tough to complain about that. While in the food stall, I spotted a flyer asking for volunteers to teach English at the library. 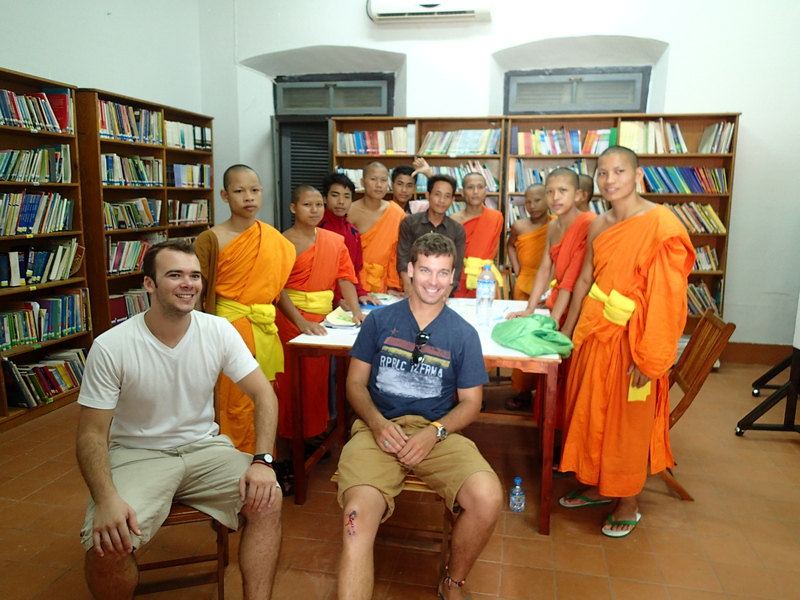 Every day at 1:00, a group of novice monks meets at the library to learn English. I ambled in, and met the delightful girls who worked for the charity running the program, an American girl named Yuwen and a Frenchwoman named Clem. The monks were all a smiling chattering bunch, outfitted in their flowing saffron robes with their shaved heads. They ranged in age from 13 to 19, and were all incredibly grateful to have another person to help with their studies. The fact that I was a man was also a benefit, as we’ll see when we get to the rules. I immediately fell in love with the kids. They reminded me of the old days at the Boys Club, and I couldn’t have been happier with the experience. After class was finished, I spent another hour sitting around talking to them about their lives as monks. The novices are mostly poor children from the area who have come to the temple to continue their education. As evidenced by their English skills, it seems to be a fine system. Most of the novices will someday “disrobe” and re-enter regular society after they complete high school. A few will go on to become full fledged monks, but that appears to be less than 5%. One novice, nicknamed Nam, really took a shine to me and asked if I’d be back. I told him that I’d be gone for the next two days to go to an elephant camp on the banks of the Mekong, but when I got back on Friday, I’d come back and help again. He graciously asked if I’d like to come to his temple with him, and I immediately took him up on the offer. I was reminded of my friendship with Man, back in Hoi An, and how graciously he offered to show me around his homeland. The people here really are a different breed. Kind, caring and generous to a fault. Their simple way of live and the happiness with which they live is a true testament to the human spirit. It also makes me take a critical look at the life I live back home. I always said I either want to be the richest guy in the bar or the most interesting. Seeing how happy the Laotians are really makes me doubt the worthiness of the first goal. Also makes me think that there is an awful lot to see in the world, and very little of it resides in bars. I spent about 5 hours with the monks at the temple on Friday afternoon. They showed me where they slept, ate, prayed and studied, and then I got to take part in their prayer/chanting ceremony at sundown. It was a surreal experience. Nam told me that before he got to the temple, he’d never had electricity before. His mother died 4 years ago, and she had never had power to her home before she died. I thought back about my own family, and realized that even my great-great grandparents had power to their homes before their deaths. The massive gap in standard of living was truly striking. Nam also showed me a large picture book of famous Laotian monks. It was interesting to hear about the hierarchy of Buddhism, which seems to vary wildly from country to country. Seeking to find some common ground, I told him that the Dalai Lama’s brother lives in Bloomington, 30 miles from my home in Bedford. He looked at me blankly, and asked who the Dalai Lama was. I finally found enough internet down the road to load up a picture on my phone, and he still didn’t know who he was, but Nam immediately recognized the fact that he was a Tibetan monk by the colors of his robes. In return for their room, board and education, the novices work around the temple doing various tasks. They rise every morning at 4AM for prayer, then collect alms and food from the villagers at 6AM and then make breakfast for themselves and the monks. After breakfast, they work on their studies, some going to classes like I helped with, and other going to night classes at various schools in the area. At sundown they pray again for around 45 minutes, then complete their studies before turning in around 10. Nam also told me the 10 rules of being a novice monk. As you can see, they were quite excited to have a man helping with the class, because I could actually physically interact with them instead of the somewhat tetchy interactions that they have to have with the women due to the no touching/no taking anything from the hands of a woman rule. I could pat them on the back, pull their notebooks over to me to check their progress and shake their hands when we left. It was one of the most rewarding experiences I’ve had on the trip so far. I gave Nam my email address, and he promised that he would email me as soon as he gets onto a computer. He’ll probably be disrobing sometime in the near future, and I would like to help him financially to get on his feet as he continues his studies. I’d imagine that even $100 would make an absolute world of difference as he re-enters the secular world, away from the quiet, aesthetic life that he has known for the last 4 years in the monastery. Charity is great, but being able to make a significant impact on the life of someone you’ve actually interacted with is even better.